All transactions are safe and secure with a reliable history in online purchasing behind each of our associates. 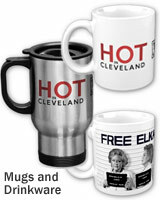 Buy the Hot in Cleveland Mugs to own Hot in Cleveland clothing and merchandise. If you like your tea or coffee Hot in Cleveland and everywhere else, then these dishwasher and microwave safe mugs (not including travel styles) are the perfect way to start your day. If you're constantly on the go like Melanie, Joy and Victoria, perhaps a Hot in Cleveland travel mug would be more fitting. Other drinkware options include a frosted beer glass, steins and two-tone coffee cups. We know Elka would approve and she's picky. Get one as a gift or for yourself. In addition to the Hot in Cleveland Mugs above, browse the Hot in Cleveland Clothing Gallery for more apparel like men's and women's clothes, kids shirts or hoodies.